I've listed this one first as I think this is probably one of the most important and productive ways to find owls. With the photography that I do, I spend a lot of time engaging and linking in with land owners and farmers. Their knowledge of the land really is a huge help in locating or at least getting to know what's regularly seen. Over the years that I've been an active wildlife photographer, I've had the huge privilege of having access to a lot of private land by extremely generous people. In fact I spend most my time photographing wildlife and in particular owls on private land. Although it can be quite daunting to approach land owners for access, you generally find that they are also very passionate about wildlife themselves and generally are more than happy for you to photograph owls on their land. One benefit of photographing owls on private land is that you can spend the time getting to know the species with the disturbance of the general public, so it’s a privilege you need to look after once you have gained the access. Further more to this, as long as you respect the rules of the land owner, then word gets around and you'll find other landowners granting access to their sites also and it grows form there. I always have the utmost respect for the lander rules and offer them prints as a way of saying thank you which always goes down well. Its the least you can do !! As with any species of animal, if you are really looking to capture those intimate moments in their lives, then my advise is to get to know the species extremely well. Owl photography is no different. Before I take any images, I spend weeks sometimes months watching and monitoring the bird until I can almost predict when and where it will appear. Get to know their flight patterns, what time of day do they appear?, do they have a favourite perch etc? 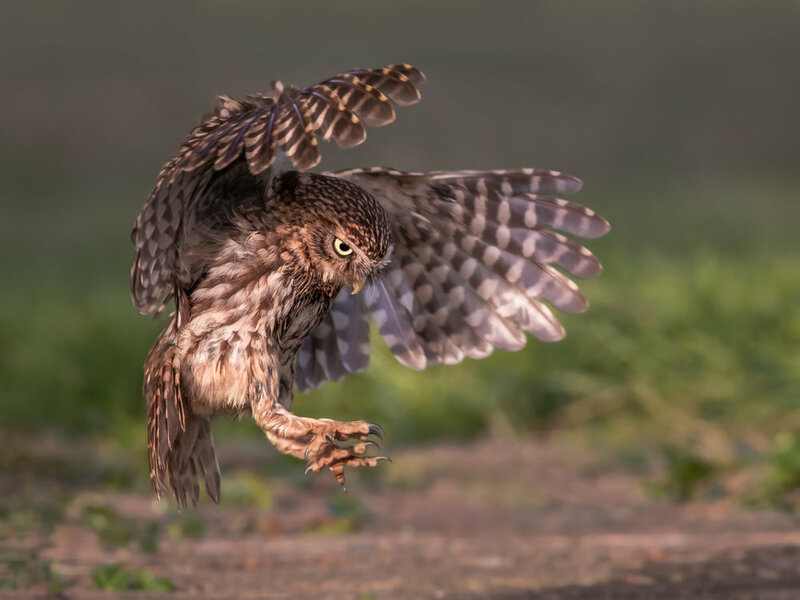 Owls are most definitely creatures of habit, so becoming familiar with their behaviours, will really benefit in the long run, and in time, you will increase your chances of capturing that wonderful owl moment. As well as getting to know the habits of owls, find the ideal habitats. This is largely dependant on the type of owl you’re looking to photograph as they all have their preferred habitats, but if we take Barn Owls as an example, then you are looking for meadows and grasslands where their prey of field mouse and voles exist. It also pays to find these areas where there are also old farm buildings or large trees. These are always a good place to find Barn Owls. When I’m scouting out new locations, I find myself always on the look out when driving. You’ll be surprised how many new locations I’ve spotted from the car and consequently visited. If you find a potential site then visit it and watch at the right time of day. There’s little point visiting a site during main daylight hours if we’re talking about Barn Owls. Visit at first light and the end of the day and just watch the area. If you don’t see anything, don’t give up. Just because nothing shows on the first visit doesn't mean the birds aren’t in the local area. Put the time in and you will be rewarded. Fortunately, owls tend to leave some visible signs on their presence. One of my techniques when I’ve found a potential location is search the trees and any old buildings on the site for these physical signs. 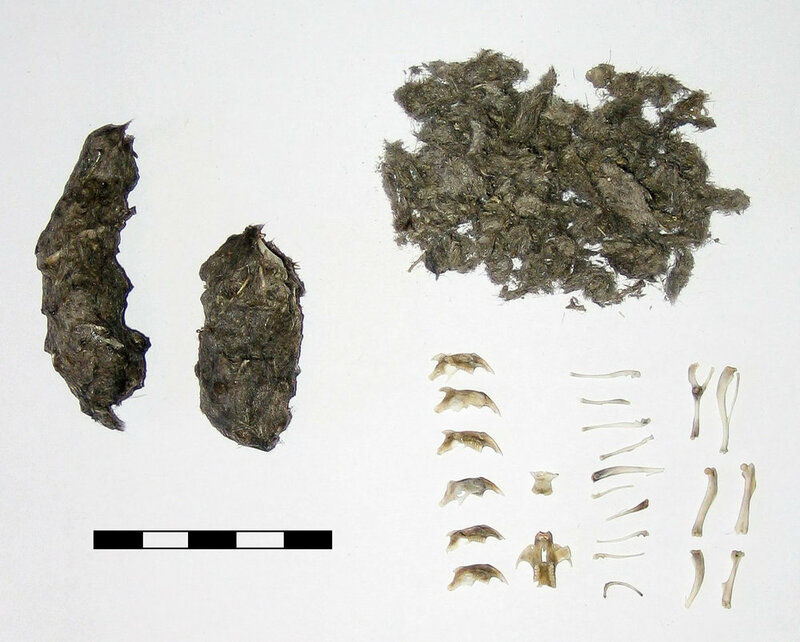 One sure way of knowing there are owls in the area are pellets. This is a clear sign that they are in the area and using the location above the pellets as a perch. If when I’m searching the trees on the site, I’m looking in particular for a hollow in the tree. You are very unlikely to see a barn owl peering out of a hole, but what you do often find are small feathers stuck to the bark on the entrance to the hole itself. 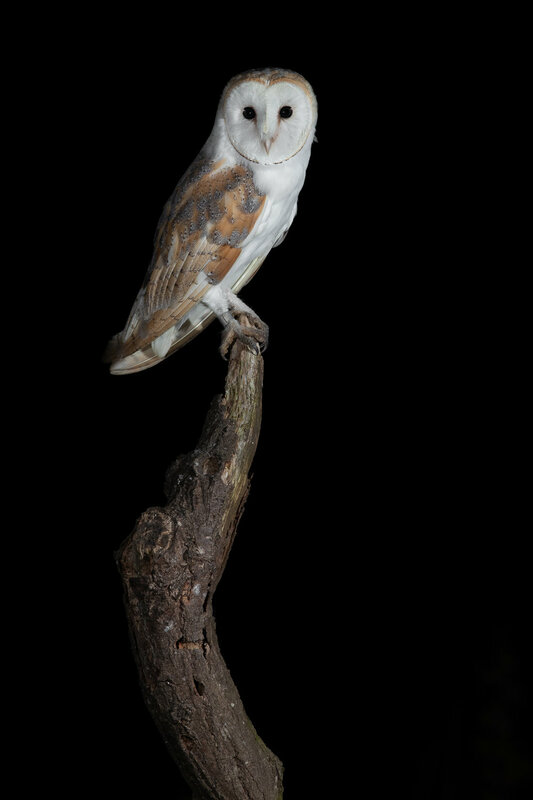 With Barn Owls this is very obvious as they are pure white and stand out from the dark bark. Tawny owls on the other hand do peer out of the hole so it’s not uncommon to find those if you’re lucky. This is the one tip that I can’t stress enough. Unless you are very lucky, and it does happen that you can just come across an owl, it can take a lot of time to find them. I’m a firm believer that you get out what you put in. A lot of people think that I just turn up at a location and capture my owls images fairly easily and regularly. This is infact not the case as I can go weeks even months without capturing a single image. It’s all about the time I invest in the previous tips shown here, which lead to opportunities in capturing images of these wonderful birds. For me, its not all about just capturing an image of the owl. I get most my pleasure in just being outside and spending time with them. Even if I don’t take a shot, I’m still happy to have seen them and watched them in the wild. When you spend so much time with them, getting to know every move and individual character, they become personal friends and you get very attached. Consequently, they comfortable and happy with your presence which at the end of the day is the most important thing. It’s when you get to this stage, that those close, personal encounters present themselves, leading to those image you can be proud of. You see a lot of these images on social media now of owl images that have been captured at night using flash. Now I’m not against the use of fill flash for wildlife photography during the day, but I have grown to dislike its use on nocturnal owls. I once used flash, albeit I would regard as responsibly for owl photography if you went back two years, but I made a conscious decision to not do this purely for the welfare of the bird. I appreciate this is a very grey area and there is actually no concrete evidence to show that it adversely affects them, but I have shown in my recent images of owls photographed at night, such as the one shown here, that you can obtain very nice images using a continuous light setup and smart camera settings This to me has no affect on the owl and it’s entirely up to the bird if they choose to land where your lights are. Although, I don’t want to be seen as the “ flash police “ as its a personal choice for all you photographers, I would encourage you to perhaps give my continuous light setup a go as I think you’d be surprised at the results. 7. Know the Rules and respect the wildlife. Certainly in the case of barn owls, they are a schedule 1 listed bird and as such are covered under certain protection by law. Did you know that unless you have a licence, it is illegal to photograph a barn owl at a nest site during the breeding season. You cannot cause a “ disturbance “ so please do not do this. If in doubt - leave alone. As with all wildlife photography, it’s paramount that you respect the wildlife. The image does not come before the welfare of the subject and that has always been my philosophy. So many times I see photographers chasing the birds around the fields in a bid to get that photo. This just isn’t on in my book. It upsets the birds, plus gives respectful photographers a bad name. If you just stay still, keep low and quiet, the bird I guarantee will come to you in the end. I hope you have enjoyed reading these short tips on finding owls and photographing them in the wild. Of course I could have gone into a lot more detail, so please let me know if you’d like to see or read anything more from me. Perhaps you’d like to know more about my camera settings or lighting setup for night photography. If so then please leave me a comment below. Anyway, thanks for stopping by. Enjoy looking for owls in the wild and please share any images you manage to take, but remember, respect their space and welfare.